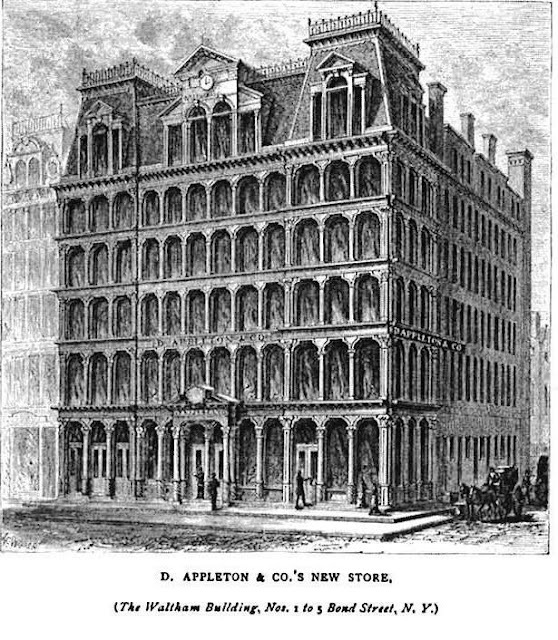 Henry A. Robbins and Daniel Fuller Appleton had hired architect Stephen Decatur Hatch to design cast iron clad building in 1871 to house their American Waltham Watch Company. The firm manufactured watch cases and both the factory and a store were established here, at 1-5 Bond Street. Then on the night of March 6, 1877 a devastating fire destroyed the building. Undeterred, Robbins and Appleton called on Hatch again and set out to rebuild their business. Hatch again turned to cast iron as his medium. The material was relatively inexpensive, highly-ornate designs could be cast to be repeated throughout the façade (whereas hand-carved details were costly in both time and money), and the precast sections could be rapidly assembled. Construction began on June 4, 1879 and was completed just under a year later, on April 30. Hatch’s new design was a celebration of the French Second Empire style. Six stories high with a tall mansard roof, it was dignified and up-to-date. The pattern of arched window openings separated by slim Corinthian columns was repeated on the second through fifth floors; each story separated by a slightly projecting cornice. The mansard roof featured three pavilions with handsome dormers, giving it a more distinctive air. The Publishers Weekly printed a sketch of the new building in June 1880. The original iron cresting on the roof has sadly been lost. (copyright expired). The publisher’s offices were on the second floor where W. H. Appleton’s private office was “handsomely furnished.” A full day’s labor was necessary to move the book company into the new building with over 1200 cases required to transport the stock. By 1880 the end of the year, American Waltham was producing around $2 million worth of watch cases from its new home. In the years before the invention of the wristwatch, every gentleman had at least one pocket watch, very often fashioned of gold. Although the 1893 Annual Report of the Committee on Fire Patrol lists only D. Appleton & Co., as tenants in the Waltham Building; four years later offices were being leased to other firms. In 1897 A. Friedlander & Co., cloak manufacturers, was here. By the later part of the 20th century the Robbins & Appleton Building had housed a variety of small businesses and manufacturers. In 1988 it was converted to residential use with four apartments on the second through fourth floors, two on the fifth and four on the sixth floor and in the mansard. More recently the interiors have been remodeled into sleek, modern apartments; quite unlike the “handsomely furnished” Victorian offices and the manufacturing spaces the original owners knew so well. In 2011 a duplex penthouse in the magnificent mansard roof sold for just over $2 million. The Robbins & Appleton Building, despite losing its cast iron roof cresting, is a remarkable example of French Second Empire. Looking as though it belongs more on Main Street in Walt Disney World than on Bond Street, Manhattan, it was designed a landmark in 1979.